Every dealer should have 1 bottle of this. For calves that have snotty noses, scours and about to die, this is the "last chance" product. 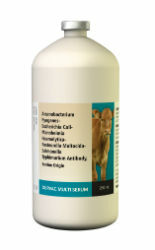 For use on Cattle and Sheep as an aid in the prevention and treatment of enteric and respiratory conditions caused by the micro-organisms Arcanobacterium Pyogenes-Escherichia Coli-Mannheim Haemolytica-Pasteurella Multocida-Salmonella Typhimurium Antibody. Use entire contents when first opened. Inject subcutaneously or intramuscularly. Calves: 20-40 ml as soon after birth as possible. Administer at 12-24 hour intervals until improvement is noted. Store at 2˚ to 7˚ C. Do not freeze. Product contains thimerosal and phenol as preservatives.